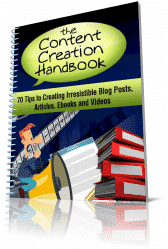 The Content Creation Handbook contains a wealth of hints and tips on creating irresistible blogs, articles, ebooks and videos. There are 70 tips in this 38-page document. Just click the download button below to get your copy. How to Create Call to Action Buttons That Get Clicked Your call to action button serves no purpose if it doesn’t scream “click me”.